Thanks to the spread of high-resolution laptops and associated content, there is increasing demand for high-resolution data projectors in the workplace. 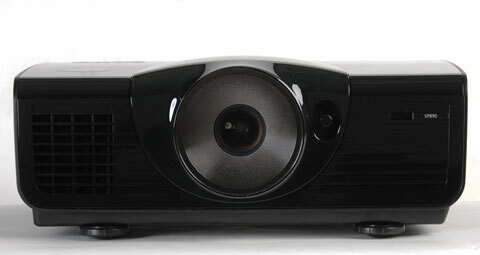 The BenQ SP890 is one such projector, a 4,000 lumen 1080p DLP projector that's tailored for presentation use. Unlike other 1080p business projectors, the SP890 has a 50,000:1 contrast ratio, making it a good choice for the display of photography or other images on a large screen. Color is more accurate than many competing models as well. A 1.5:1 zoom and H/V lens shift make the projector easy to install, while dual 5W speakers are useful in a conference room or even a back-yard summertime theater. It is available now at prices just under $3,000. High resolution. What distinguishes the SP890 from the crowd of me-too business presentation projectors is a combination of factors, but the most obvious of them is its resolution. At native 1920x1080, the SP890 brings the highest commonly-available widescreen resolution into the workplace. This makes it well-suited to the display of detailed content such as photographs, data graphics, spreadsheets, or even video. And while 1080p resolution isn't necessary for the display of text documents or Powerpoint presentations, those look great as well. Any content you choose to display on the SP890 comes out looking crisp and sharp. Light output. Then again, if all you need is 1080p, there are plenty of home theater projectors available that will do just that--some of them for less money. But the SP890 has more than one trick up its sleeve. It is rated at 4,000 lumens of brightness, far exceeding the typical lumen output of a 1080p projector. Our test sample at its brightest measured 2692 lumens, or roughly 67% of the specified maximum output. This output was measured in Dynamic mode using high lamp and the widest angle lens setting. This mode emphasizes highlights at the expense of contrast and color accuracy, so it is best used when you have a high-contrast document where color is not critical, such as a simple Powerpoint presentation or text document. Presentation mode, with slightly better color and contrast, measured 2092 lumens (also in high lamp mode). However, if you are really looking for great color performance, there is no replacement for custom calibration. After such a fine-tuning, our test sample measured 853 lumens. This is not much for a presentation projector, but grayscale tracking was very close to the 6500K standard and contrast was excellent. For the display of film or photography, this is an excellent operating mode. Several factors can adversely affect lumen output. First of all, using the telephoto end of the zoom lens (smallest image at a given distance) will reduce lumens by 10%. Using low lamp mode, which increases lamp life from 2,000 to 3,000 hours, also drops lumen output by 22%. VGA signals measure roughly 10% brighter than HDMI signals, so using the projector's VGA port will result in a slightly brighter image than our readings would otherwise imply (we used HDMI). We did not see any significant lumen reduction when using the extreme edges of the lens shift range. I just "love" it how although BenQ claims this is a 4000 ANSI lume brightness PJ, the absolute highest output that the PC lab guys could squeeze out of it was 2700 lumen. And when they had the thing calibrated properly, all of a sudden the output dropped to just a laughable 850 lumen! Contrast ratio at a whopping 50,000:1, eh? Yeah, right. Ultra slow-mo color wheel created rainbow light shows and beaucoup de digital noise -- now, that's more likely to occur with this one. At $4,000 list, just about anything else out there beats this clunker. Donizelli, you must have overlooked the part where this review clearly states that this PJ is for "presentation" purposes used in business or education...not designed or intended for home theater use. The 2700 lumen measured was via HDMI connection. The review states the lumens will be higher if one uses the VGA connection. There is nothing deceiving with what BenQ is advertising this projector for.